When the “Friesische Brauhaus zu Jever” was founded by Diedrich König in 1848, it was only one of several breweries in the region. König, however, was convinced from the beginning that his beer was something special. After his death in 1867, his son sold the brewery. Theodor Fetköter took over the brewery. He began by developing the small family business into a large brewery operation, started to advertise and developed special bottles. In 1848, he played an important part in installing the first water supply system in Jever. The First World War was a difficult time for the brewery. Theodor Fetköter’s son, who had taken over the business, was killed at the front. The brewery was sold once again, in 1922, to the Bavaria – St. Pauli Brewery brewery, based in Hamburg. Today the Bavaria – St. Pauli Brewery is owned by the Danish Carlsberg Group. By then, beer from Jever had become known outside the region where it was produced. Since 1934, it has been sold under the name “Jever Pilsener”. After World War II, the brewery once again found itself experiencing difficult times. Due to a fuel shortage, beer could only be sold from the brewery gates directly to customers. It was also necessary to scour the region’s farms for malt. After the post-war period, the situation in Jever improved once again. The top-selling beer was “Jever Export”, which was brewed until 1990. During the 1960s, Pilsener beer became more and more popular and sales figures for Jever Pilsener increased. During this period the brewery was expanded. Since 1994, the brewery has belonged to the Dortmunder Brau & Brunnen Group, which itself has been part of the Oetker Group since the beginning of 2005. 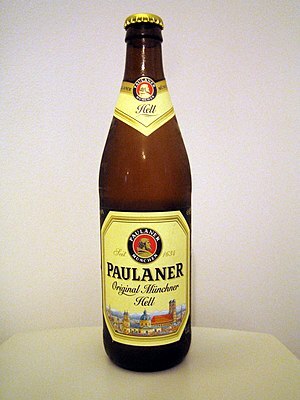 The name of the Paulaner brewery refers to the order of friars that resided in Neuhauser Straße in Munich who were part of the order of Saint Francis of Paola. The monks had brewed beer for their own use since 1634. The beer that was permitted to be sold on holidays was a Bock style which gained local fame. After the abolition of the Neudeck Cloister in 1799, the building was converted into a penitentiary. Franz Xaver Zacherl, the brewer, purchased the former cloister brewery and continued the “Starkbier” tradition with the product Salvator, which is Latin for “Saviour”. In 1861 the “Salvatorkeller” (Salvator cellar) was opened upon Nockherberg. In 1928 the brewery merged with the Gebrüder Thomas brewery creating Paulaner Salvator Thomas Bräu. 1994 saw the acquisition into the Kulmbacher brewery group with the affiliated producers Plauen and Chemnitz. A daughter company is the Auer Bräu AG Rosenheim. Paulaner belongs to the BHI (Brau Holding International AG), a joint venture between Schörghuber Ventures (50.1%) and with the Netherlands’ Heineken N.V. (49.9%).